Lawsons stock a comprehensive range of general building chemicals, from Sealants to Adhesives we are sure you will find what you’re looking for at a great price! We sell top UK brands such as Geocel, Feb, Sika Everbuild and Bostik with our policy to sell high quality products from brands that you know and trust. Whether you need bonding agents, plasticisers or a solution for your damp problems, Lawsons is happy to help make your shopping experience easier with our technically trained staff, pop into a branch today for any questions you may have! 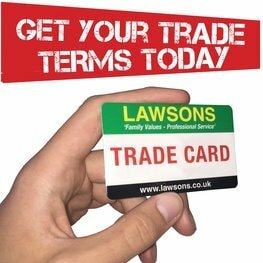 At Lawsons we pride ourselves on being a professional, knowledgeable, responsive and friendly independent one stop timber, building and fencing merchant, operating throughout London and the Southeast! With over 50 years experience we are one of the longest serving builders merchants with plans to open more stores over the country! Our policy is to sell brands that you know and trust, all of which you will find in most Lawsons branches. Stick with us! Our extensive and varied adhesive range covers your profession, or project; from the big scale, to the finishing touches. Comprising from some of the leading brands in building solutions you can be sure to find the right products for the most specific of jobs. Our in depth and detailed range of additives really is the best, "addition" to your project. From professional plasticiser for your mortar, to high concentrate mortar stain remover, for all those DIY mishaps, you can feel confident nothing can subtract from the most impressive finishes. "Seal" the deal anytime of the year with our seemingly endless catalogue of sealants. With application from sub zero temperatures, straight up to 1500 Degrees, internal, external, and even underwater! There truly is the right sealant to finish your masterpiece.